It’s New Years Eve and Michelangelo is spending it watching a New Years movie marathon, learning what people do to celebrate the holiday. Mike considers going home, but knows that if he did, it would be just like any other night: Donatello would make him help fix some contraption, Leonardo would make him do training routines until he collapses and Raphael would teach him how to be more aggressive in both fighting and trash-talking. Instead, Mike decides to go searching for a party to crash. He eventually finds one going on at the Natural History Museum and low and behold, a guy named Carl in a Godzilla suit is tossing his wristband entrance pass to the ground (citing over a cell phone call that he “can’t go through with it”). Mike scoops up the pass and waltzes into the costume party. He is immediately picked up by a shapely dame in a cat-suit, who recognizes him as “Carl” and tells him to follow her to meet with the others. Thinking he’s on his way to a VIP lounge, Mike tags along. They meet up with a gaucho, a mime and a princess and Mike learns the truth: he borrowed the electronic pass from a thief! The thieves knock-out the security guards with gas and then proceed to a laser-secured hallway where the priceless green Dresden Diamond is being held. “Carl” is told to hack the computer and turn off the lasers. Mike (still playing along), tries to talk them out of it by badly mangling some of Donatello’s techno-jargon, explaining that the system is impenetrable. The gaucho, not wanting to disappoint the terrifying man who hired them, opts to torture a guard for the access codes. Not liking that option, Mike takes some of Leo’s training to heart and flips his way through the lasers. Safely on the other side, Mike smashes the glass case and takes the Dresden, setting off all the alarms and (hopefully) alerting the authorities. Mike attempts to sneak away with the diamond so the villains can’t get it, but the gaucho tells him that if he scampers off, he will start shooting party guests. 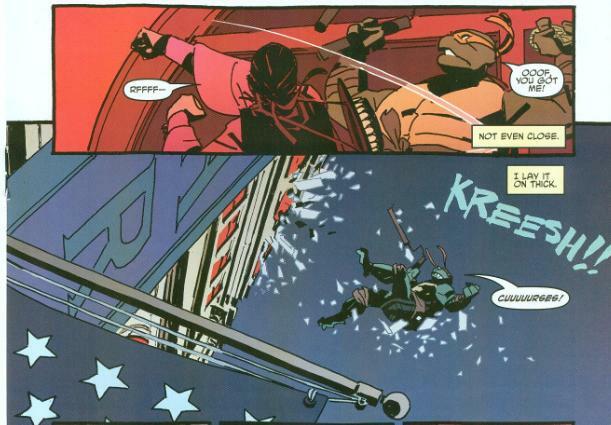 Mike then uses some of Raph’s trash-talk to goad the gaucho into hitting him. Mike fakes being knocked back and falls through a window. Noticing the cat-lady has vanished, too, the gaucho tells the mime and the princess to wait for him in the alley while he deals with their traitors. On a nearby rooftop, Mike is held at gunpoint by the cat-lady, who happens to be an undercover cop. She tells “Carl” that he doesn’t truly know who he has been hired by: this new villain is sending the old crime lords of New York scurrying in fear. Mike takes her gun and reveals that he wasn’t actually planning on stealing it. He asks what made the diamond so special and the cat-lady tells him that an exposure to radiation turned it green, making it one of a kind. Suddenly, the gaucho arrives with his personal gang of thugs. Mike takes them all out with little effort and decks the gaucho with the diamond right as the clock strikes midnight. The cat-lady introduces herself as Kara and shakes Mike’s hand. Mike reveals he’s not really “Carl” and gives her the Dresden Diamond. Mike then ninja-vanishes, considering to himself that he had a pretty good New Years Eve (though he’s going to keep his handshake with Kara a secret so as not to make his brothers jealous). In an alley, the mime and the princess are freezing their butts off, wondering where the gaucho went. *This story is continued from TMNT Micro-Series #1: Raphael. 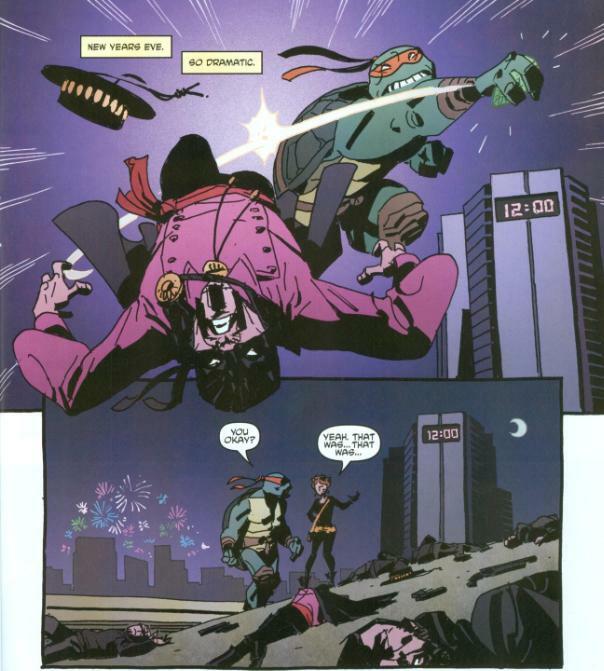 The story continues in TMNT (IDW) #6. *Detective Kara Lewis won't be seen again until TMNT (IDW) #47. 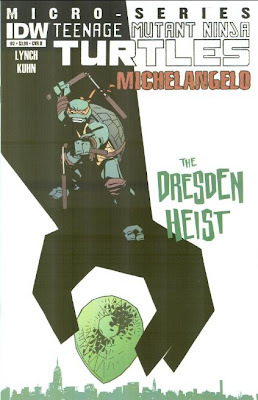 *This issue was originally published with 4 variant covers: Cover A by David Peterson, Cover B by Andy Kuhn and Bill Crabtree, Cover RI-A sketch variant by David Peterson and Cover RI-B by Kevin Eastman. I’ve got to say, I really appreciate these microseries from IDW. Not only do they help speed the storyline of the ongoing series along at a more palatable pace, but they’re infusing the Turtles with more personality and traits than they’ve been getting in the main series. The first arc of TMNT was all about trying to bring them together whilst covering the fragmented origin. Save for perhaps Raphael, none of the Turtles in the ongoing have yet to really get any personality (I think THIS is the first issue to make mention of Don’s intelligence); they’re all still blank slates five issues in. These character-themed microseries give us the focus on the individuals the series desperately needs, so now the Turtles are actually interesting! What had me curious within the first couple of pages is the reveal that the Turtles are unfamiliar with human life and rituals; that all of it seems alien to them. Mike is out learning the meaning of New Years Eve and what exactly people do for entertainment on that supposedly special night. Considering the revelation from TMNT #5, that the Turtles are reincarnated children from Feudal Japan, this total lack of understanding of modern human culture makes a certain amount of sense. They’re being played as “amnesiacs” at the moment and having to learn everything from the ground up. It’s certainly nice to see the characters grow, though I can foresee this angle getting tiresome if done in excess. As a spotlight on Michelangelo, Lynch naturally chose to focus on his humorous “party dude” characteristics. I’ve gone over this time and again, but I’m of the opinion that Mike being the fun-loving class clown is perfectly fine, so long as it isn’t his sole defining trait; giving him no aspirations or dimensions beyond party-this, party-that can make him utterly obnoxious. Since we’re still pretty early into the game, I can understand not offering more to Mike than his goofiness in this issue. IDW’s TMNT series has been all about spoon-feeding characterization and plot to the audience one itty-bitty nibble at a time, so though Mike may be strictly a “party dude” right now, I’m hopeful that he’ll grow to have more elements to his character over time. Be that as it may, Lynch writes a pretty fun and occasionally funny script in this issue. Mike’s inner monologue, particularly the exaggerated way he imagines his brothers, reminded me quite a bit of Tristan Jones’s Tales of the TMNT (Vol. 2) #64. 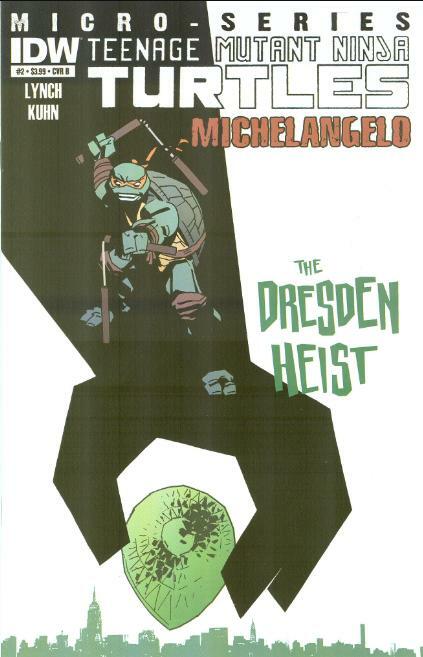 What keeps Mike’s fun-loving nature in check with this story is an underlying intelligence to the Turtle, as he rolls with the scheme of the thieves as he’s thrust into it, improvising (albeit poorly) along the way. Most of the humor in the issue comes from Mike’s sloppy attempts to “act natural”, and while the joke begins to wear thin near the end, it can be pretty funny. Lynch also continues the narrative foreshadowing of some ominous mastermind hiding behind the curtains. Presumably it’s Shredder, but we’ll just have to wait and see. Art-wise, I can’t say Andy Kuhn did a whole lot for me. His style is rather flat and he has this habit of giving Mike this dopey grin and squinty-eyed face that makes him look, like, well… Really, really dumb. He also has a hard time deciding how "wide" he wants Mike to be; he can look ridiculously waffle-shaped in some panels. Likewise, he never settles on a height; the scale of the character is constantly in flux. I think the real spotlight belongs to Bill Crabtree’s coloring, particularly in the way he bathes pages in a certain color for effect (the museum party is purple, the heist is red, the outdoors are a grey-blue, etc.). It breathes a lot of life and energy into Kuhn’s competent but occasionally crude pencils. Michelangelo #1 is a decent story. Not great, not bad, but with very little overtly wrong with it. It introduces new readers to Mike’s personality for this series, which is important since before now he had no personality. He’s still fairly one-note but with room to grow. It’s enjoyable, just not something I think I’ll be remembering a few more months down the line. Boy, I'm really falling behind on my TMNT reading this holiday season. What's it been, 4 TMNT comics published in the last 5 weeks or something like that? I keep being underwhelmed by the IDW series. The art in this isn't even up to par with Duncan's stuff (which is crude, but is growing on me, and the story reminded me way too much of my least favorite Mikey, the 4kids version. It's not bad, as you say, but not something i'd write home about. 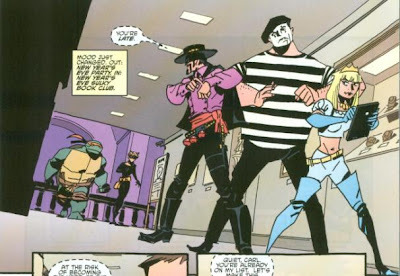 Are you aware of the references to teh Mirage-Michelangelo one-shot?